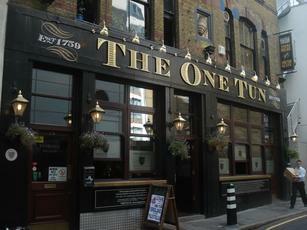 Popped into The One Tun as I heard it had changed ownership, What a difference! Great food, great choice of drinks and a warm welcome! Had a couple of pints of Doombar which was excellent and had some food from their pan-Asian menu which was delicious. I will definitely be back. Went in for a meeting of my football league committee the other day. Nice pint of Adams lighthouse, but when I asked for a pint of water alongside to slake my thirst the barmaid said she wouldn't trust the water enough to drink it! Strange place. Food looked nice, but not sure id eat it if the staff don't even want to drink the water. Don't miss the big picture three women urinating in the upstairs function room. Not a bad spot overall. An old skool London pub, these sort of places keep a bit of character in the area, rather than countless chain pubs and food places everywhere. Has the advantage of being across the road from where I'm working. Fine for a quick beer at lunchtime/just after work, before the commute. A real old fashioned working pub.